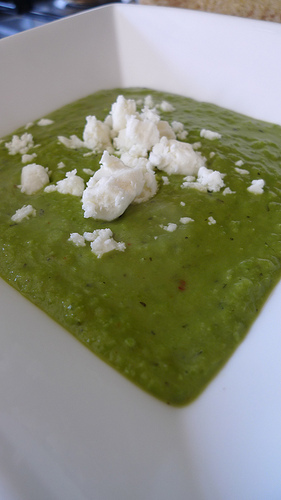 I made this as a bit of an experiment, I love peas with mint and chilli so thought I would try and combine them into a lovely spring/summer soup ready for my fresh pea harvest. Fry the onions and garlic in a the butter until soft and translucent, try not to colour them. Add the Peas and fry for a couple of minutes before adding the stock. Add the mixture to a blender, whizz until smooth, season with salt and pepper. Serve with the feta crumbled over the top. You can also use the recipe, minus the stock and feta to make a great side dish for with meat, fish or chicken. Just fry the peas until cooked then crush lightly with a fork.